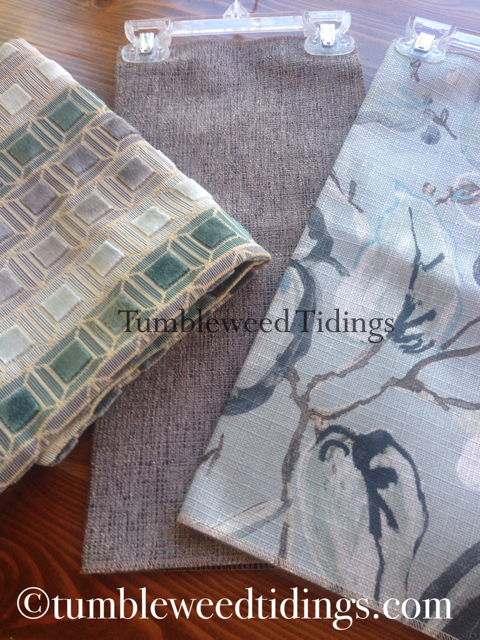 Today on Tumbleweed Tidings, I’m talking about developing a scheme for room décor, and it’s as easy as 1, 2, 3! 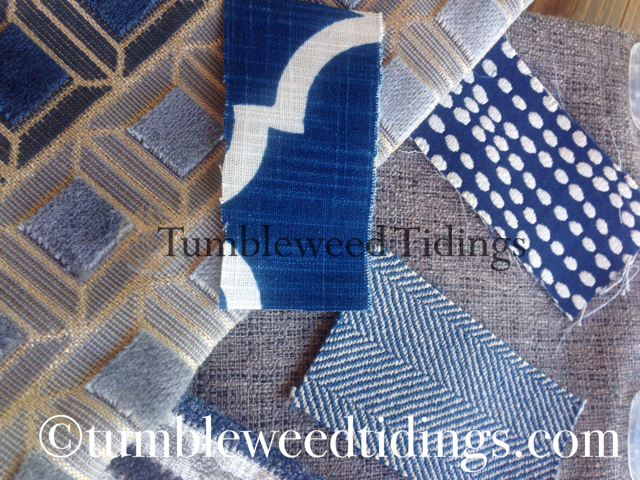 It will include how to find a jumping off point and how to select various coordinating fabrics that enhance the scheme, and how to pull it all together. Stick with me…this should be fun! How many of you remember the old days of HGTV? I started watching it from the beginning, with crafting shows by Carol Duvall, and Decorating Cents with Joan Steffend. Those shows were great because for the first time, there was a way for homeowners to get step-by-step information and ideas on how to decorate their homes. I can see my younger readers scratching their heads right now, thinking “Why didn’t you just Google it or watch a YouTube video?” Well, this was way before the internet, and options prior to HGTV were magazines or craft stores. So, these early shows were really groundbreaking, and taught many people how to make their homes look exactly as they wanted. As HGTV matured, they started offering wonderful shows that really taught you how to develop a scheme and work within a budget. I’m talking about Candace Olson on Divine Design, and my all time favorite, Canada’s Sarah Richardson and her sidekick Tommy, who had several shows including Sarah’s House, Design Inc., and Sarah’s Cottage. Those series were where I really felt like I’d found “my people.” Week after week, they would walk you through fabric samples, paint swatches, and furniture placement. They provided a graduate level class in decorating, and I loved every minute of it, filling up my DVR with episodes I watched over and over again. Today on HGTV, while I still watch Fixer Upper, Home Town, and the dreamy new Boise Boys, in my humble opinion most of the shows spend way too much time on demo, and very little time on developing the scheme of good design. They have become more about flipping houses, tearing down walls, and sledge hammering through. Often, they spend more than half of the episode on demolition and five minutes at the end on decorating the space. For most of us, we won’t be doing a complete demolition on our homes, but we will want to decorate (and redecorate, and redecorate) over the years. And to do this successfully, it is helpful to know how to develop a scheme. Finally, Diane, you’re getting to the crux of this blog!! So, as promised, creating a scheme is as easy as 1, 2, 3. • Step 1: The Jumping off Point. Most projects, whether it is writing a novel or decorating a whole house, begin with a jumping off point. 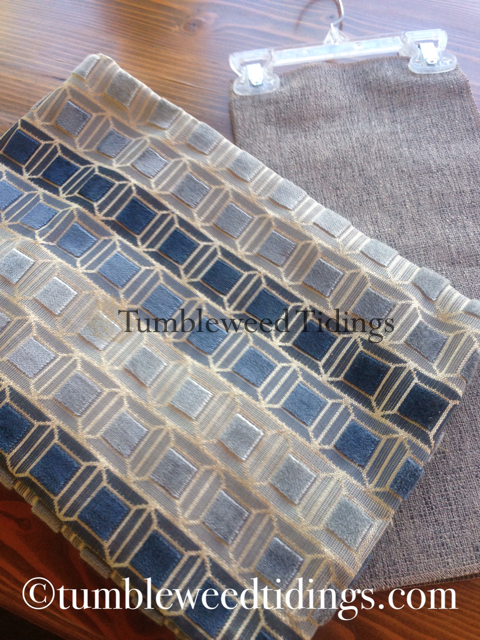 For my latest project, two waterfront condos, the jumping off point was found on ready-made pillows. 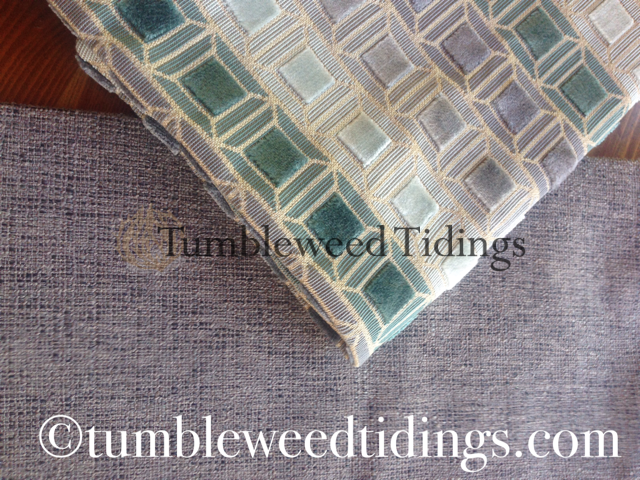 They are the same fabric, but in two different tones. One is in navy, gray and other blues, while the second one is teal, gray and other shades of aqua. From this jumping off point, the rest of the décor just fell into place. So, step one is the most important; finding a jumping off point. It could be a piece of art, an heirloom rug, a quilt, or a beautiful fabric. Once you find your jumping off point, bring the item (or a picture, if it’s too large to carry around) with you for all shopping trips from that point on. It will guide you through the next two stages of your scheme. • Step 2: The Backdrop. You may think that selecting the backdrop after you select the jumping off point seems counterintuitive but hear me out. The backdrop makes up the largest items in your space. It will usually include the paint color, and most definitely the large items of furniture like a sofa or sectional. Believe it or not, it is much easier to select a paint color or sofa fabric to match your jumping off point than vice versa. There are a gazillion paint colors and neutral fabric choices, but few amazing jumping off point fabrics or artwork that will inspire you. For these projects, the wall color is Shitake by Sherwin Williams. 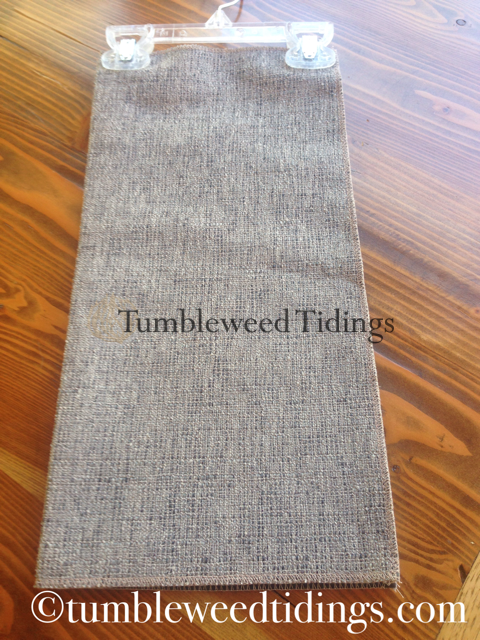 As the name suggests, it is a medium mushroom gray that goes well with almost any scheme. The next backdrop selection was for the custom sofa. 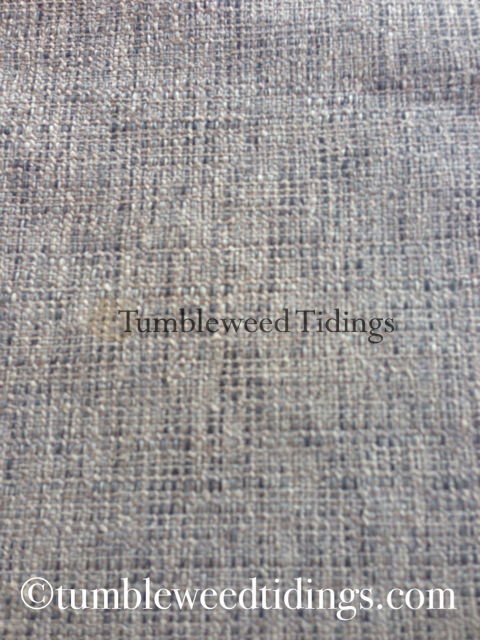 Because the client asked for the fabric to be hard wearing, as well as pet and child friendly, I chose a nubby tweed in a gray blend. After holding it up to my inspiration pillow pieces, it went so well with both schemes that each unit will have the same sofa back and wall color backdrop. Total aside…did you know that custom ordering sofas, sectionals and chairs usually does not cost more than buying right off the floor? Most store sales also apply to custom orders. 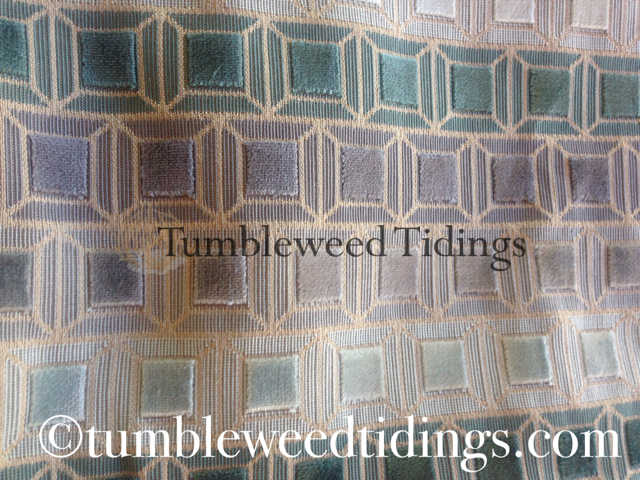 So unless you are in a rush, don’t rule out custom ordering to get exactly the color and fabric type you want. If you are not purchasing new backdrop furniture, but using what you already have, bravo! 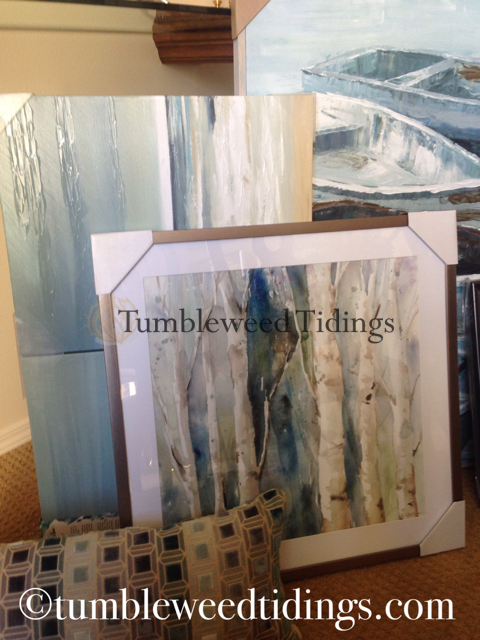 Hopefully they follow the rule of “all large items neutral, all the time” and provide you with a blank slate for all pillows, artwork, rugs and accessories. 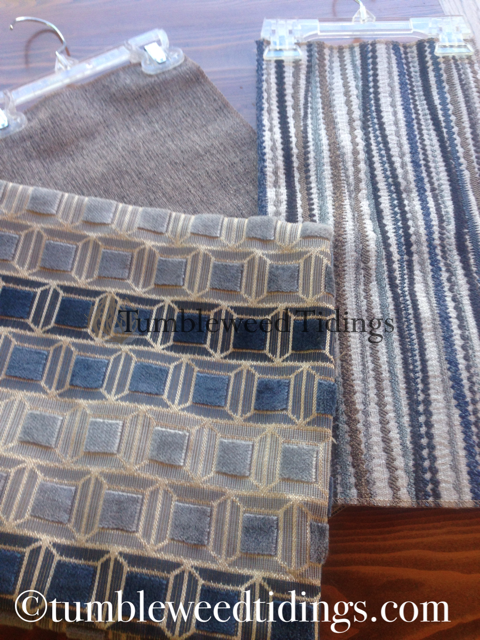 My sofas are a light herringbone fabric that don’t dictate future color schemes. Change the pillows and accessories, and it’s a good to go with almost anything. • Step 3: Reinforce the scheme through textures, artwork, rugs, bedding, greenery and accessories. Once you have your jumping off point and basic color palette, the next step is to select pillows, accessories and artwork that pull the space together. One of the great things about being able to order custom sofas for this project was that they also included two contrasting pillows in the fabric of my choice. 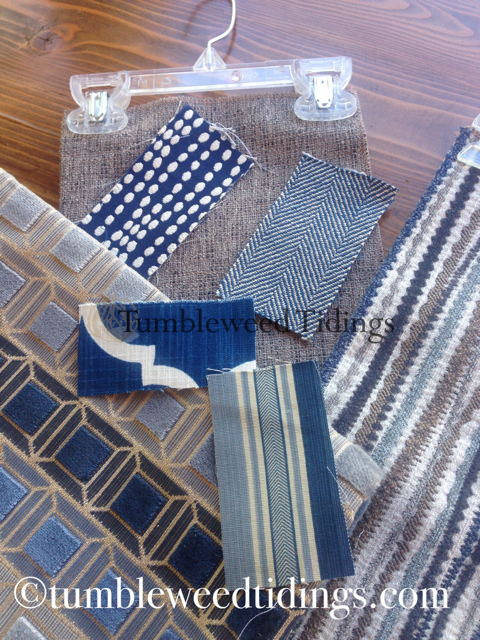 They had a myriad of colors and styles that I was able to match with my jumping off point fabrics for a good compliment. Once you have your main scheme determined, it’s time to look for the items that will give your room some interest and tell your story. This is particularly important in new construction or the complete re-do of a room. If everything is new, it can feel somewhat sterile. Wall art, word signs, vintage or found items, baskets, metal trays, throws, and family heirlooms or other antiques, can add just the right pop of color and warmth to a space. On this particular project, I was lucky to be able to purchase two vintage photos, one for each unit, by renowned Idaho photographer Ross Hall. His iconic photos are still available in a gallery downtown Sandpoint, now run by his son Dann Hall, and evoke images of times gone by in this lakefront community. Then my mother, also an accomplished photographer, was able to provide me with several photos of boats she had taken all over the West Coast. 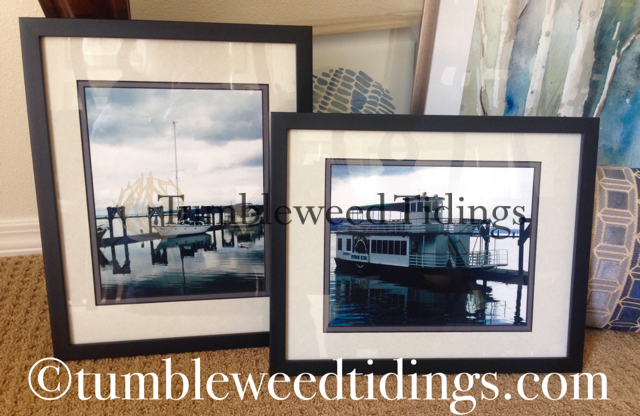 I had them matted and framed, and they will add just the right nod to the subtle nautical feeling these condos evoke. 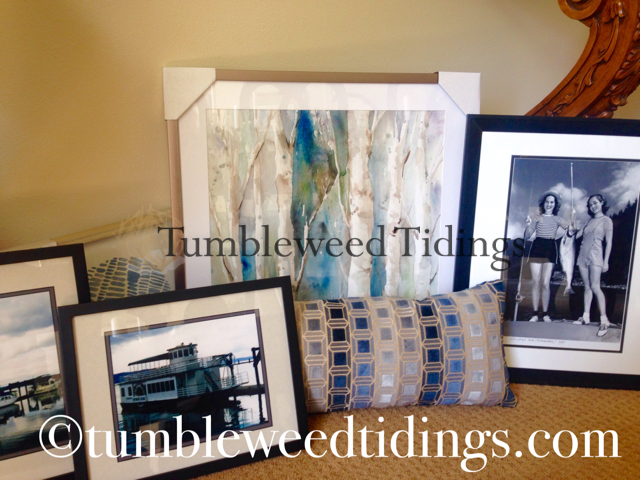 For your home, you may have photos of past vacations or adventures that, when enlarged, matted and framed, will add just the perfect touch to your space and help to tell your family’s story. The projects I used for today’s example will be completed the first week of August, and I can’t wait to show you how it all comes together. After weeks of space planning, purchasing and laying out the scheme, I hope that the finished product turns out as nicely as it looks in my head. Developing a decorating scheme really is as easy as 1, 2, 3. By following these steps, whether it be in a whole house or a single room, you too can create the space you want, all on your own. You’ve got this! Now go forth and start scheming. I agree with your HGTV assessment. I think they spend way too much time choosing the house, then the demo, then 10 minutes on the finishing and reveal. We all know that the house was chosen long before that episode was shot! Back in the early HGTV days I chose a hotel because they carried it on their TV lineup. You can imagine the reaction I got from my husband, now an avid HGTV viewer. 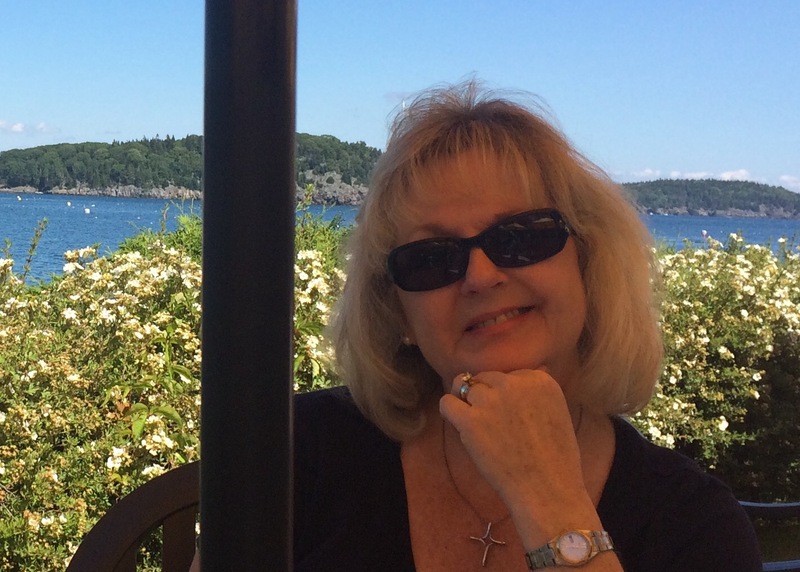 Thanks for this article Diane; another winner! Thank you Kathy! Maybe they will hear us and go back to good basic décor and design. I think a little bit about the home selection process can be appropriate, but many of us just want to improve the house we already own. I love this! But I think I need you in my back pocket when I shop! Often my house is decorated with family photos that are gifts from the kids. No theme, no color coordinating but I still want it to look inviting as I add to the walls. This is usually my dilemma. Thanks for your great insight! Thank you for the kind words. It makes doing the blog worthwhile! And HGTV was more fun. As an avid This Old House watcher, I’m always concerned about the last of attention to code compliance on the HGTV shoes that have decided that I’d rather see people putting themselves in harms way during demolition. Kind of like the new car shows teaching nothing along the way. I really enjoyed this. Thank you for the nice compliment about my photography and for using the photos of the boats. 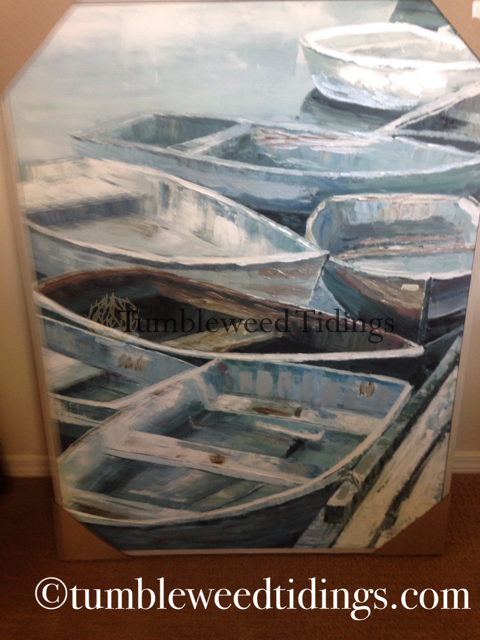 Those boat pictures will add so much to the condos! They are really pretty and I appreciate you sharing them with me.